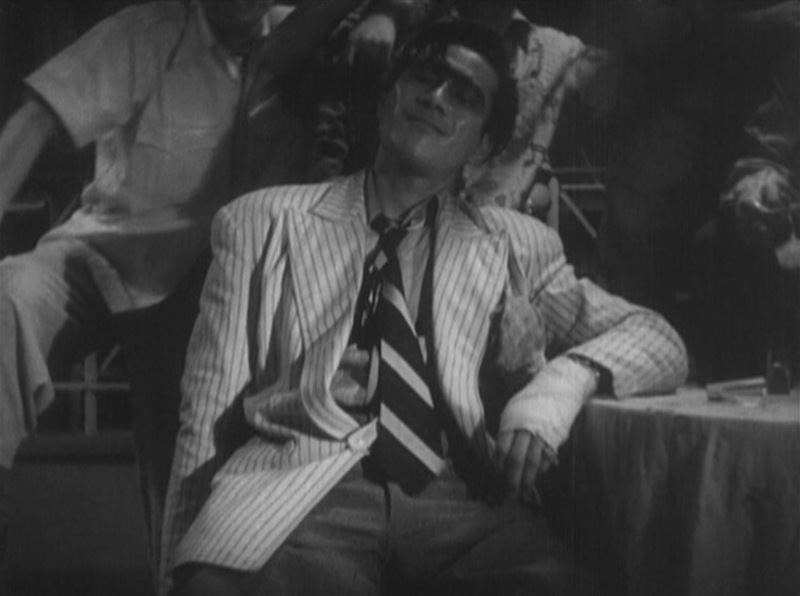 Based on the intensity of his performance, it’s hard to believe that Drunken Angel was one of Toshirô Mifune’s first movies. 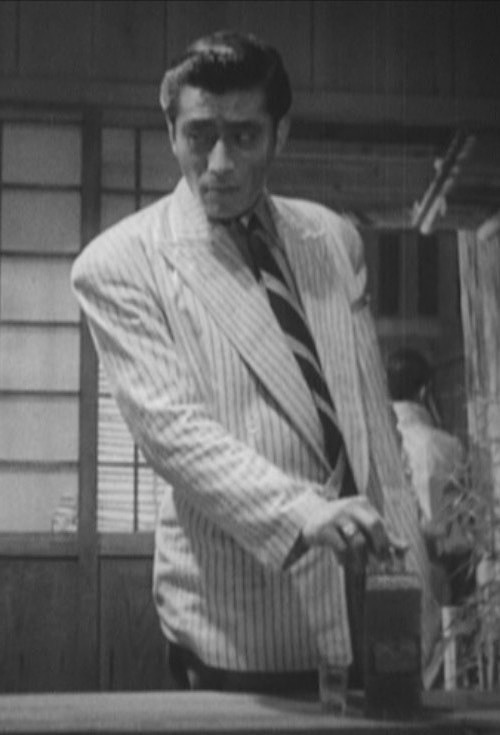 His portrayal of the cocky, conflicted, and ultimately doomed yakuza gangster Matsunaga remains a highlight of crime cinema 70 years after the film was released. 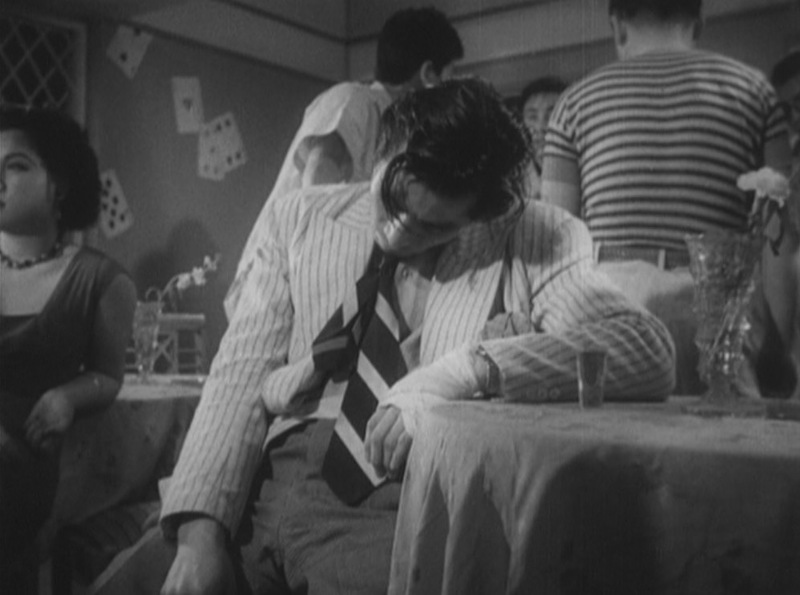 Drunken Angel begins with its titular protagonist, the alcoholic doctor Sanada (Takashi Shimura), treating Matsunaga for a gunshot wound in his hand and recognizing the gangster’s tubercular condition. Matsunaga has no patience for Sanada’s pontifications against the wild lifestyle that would only quicken his death. A tubercular breakdown forces Matsunaga back under the doctor’s care, and it appears that he is now willing to take on a gentler lifestyle with a greater chance at living longer, but a reunion with his manipulative yakuza boss Okada (Reisaburo Yamamoto) lands Matsunaga right back where he started, living a fast and dangerous life fueled by whiskey, women, and violence. Matsunaga launches back into a life of depraved, drunken foolishness. 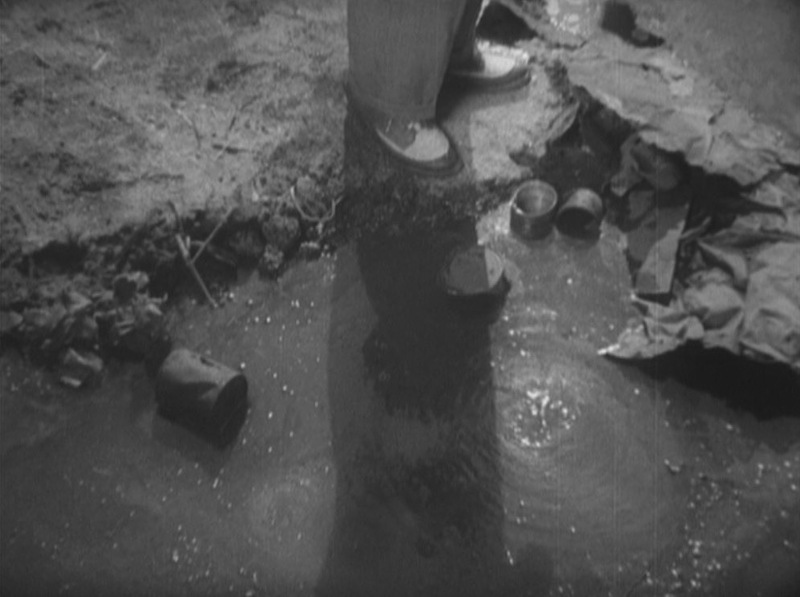 The action takes place during a summer in postwar Japan, where Matsunaga adopts a wardrobe that concedes both to the warmer weather and the conditions of the American occupation that forced Kurosawa to dress his characters in Westernized clothing. 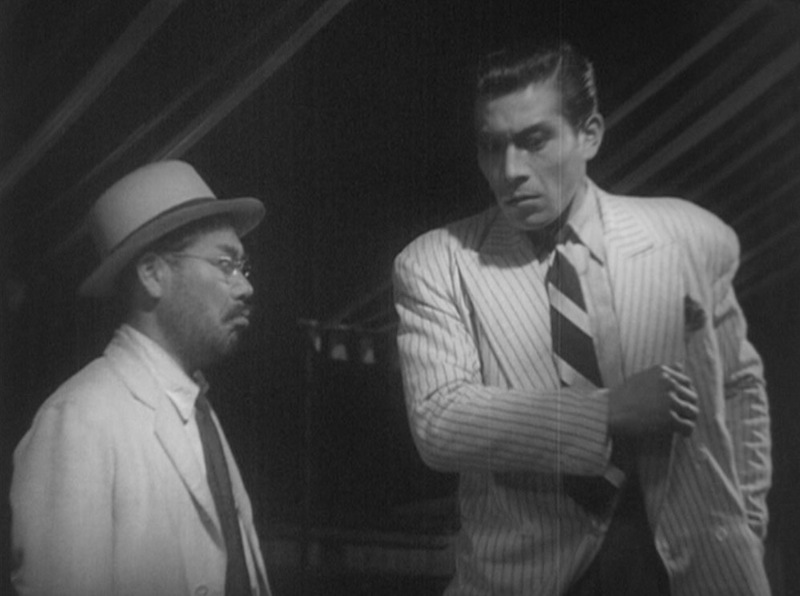 Earlier in the film, the good doctor Sanada had encountered Matsunaga exiting a nightclub in a sharp white double-breasted suit with a subtle stripe. For this night on the town, Matsunaga continues that look with a light-colored double-breasted jacket with a dark stripe, worn with a boldly striped tie and non-matching flannel trousers. 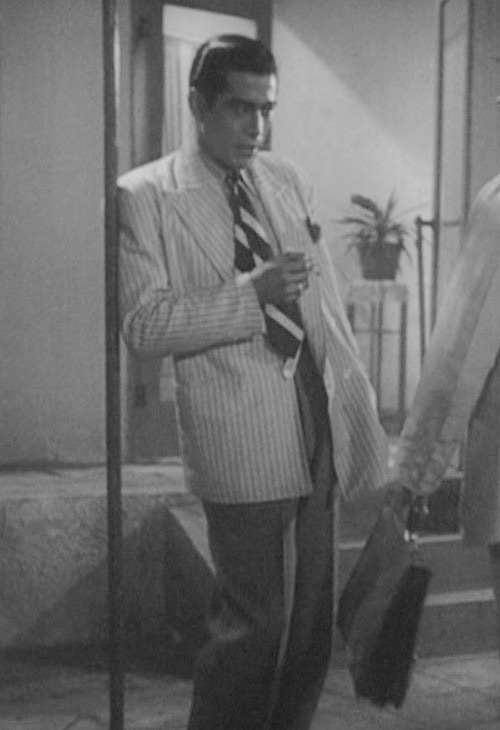 The striped double-breasted jacket is styled and cut like his previous suit jacket with wide, padded shoulders that fall off Mifune’s own shoulders and broad peak lapels that roll down to a low, four-on-one button stance with mother-of-pearl sew-through buttons. The ventless jacket has three-button cuffs, straight jetted hip pockets, and a welted breast pocket where Matsunaga wears a dark silk pocket square. Though he often wears the front of the jacket unbuttoned, Matsunaga’s suit jackets have an internal anchor button fastened to a short strap that keeps his jacket from flapping around while he’s dancing or brawling. Oblivious to his crumbling reputation and health, Matsunaga enjoys the vocal talents of Shizuko Kasagi. As with his suit, Matsunaga triples down on his stripe quotient, wearing both a striped shirt and tie under the striped jacket. However, the lower contrast – in grayscale, anyway – creates a more subtle stripe effect even with multiple stripes to each set. The shirt has a point collar, plain front, no pocket, and rounded button cuffs that he wears both fastened and unfastened. Matsunaga’s tie is striped in inch-wide “downhill” diagonal stripes spaced out against a dark ground. Matsunaga’s tie flops out of his jacket during a drunken night out. If the jacket had been part of a suit, it would have been a bold suit indeed, but Matsunaga neutralizes this flamboyance by wearing it with a pair of mid-colored flannel trousers. The full-fitting trousers have double reverse pleats on each side, slanted side pockets, button-down flapped pockets, and narrow turn-ups (cuffs) on the bottoms. His belt is a lighter-colored leather, possibly tan to coordinate with the likely color scheme of his spectator shoes. Matsunaga appears to be wearing the same spectator derbies as he had with his suit. The shoes appear to have brown leather around the apron-toe cap and quarters with a lighter vamp that may be beige or cream leather. The lace panels look to be a third medium shade, possibly a deep tan. He wears them with dark socks. Matsunaga finds himself in no place to be wearing snappy shoes like that. Matsunaga wears his usual jewelry, a diamond ring on the third finger of his right hand and a watch on his left wrist. Matsunaga flashes his ring as he accepts a shot of Nikka from his recently returned boss. Nikka whisky again appears as Matsunaga’s nectar of choice… and the fuel of his eventual downfall. The Nikka distillery opened in Yoichi, a coastal town in Hokkaido, in the summer of 1934 following master distiller Masataka Taketsuru’s apprenticeship in Scotland. 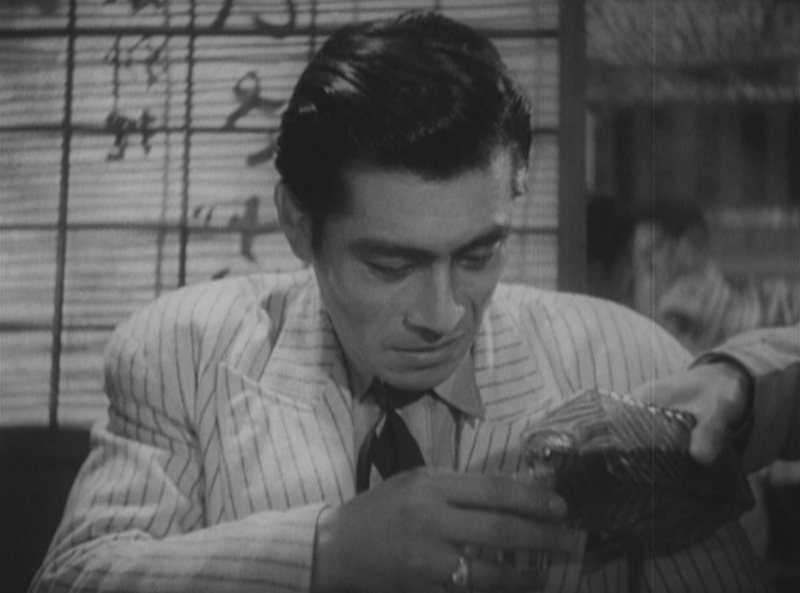 Production still of Reisaburo Yamamoto as Okada, offering a shot of Nikka Whisky (advertisement also seen over Yamamoto’s left shoulder) to Matsunaga (Toshiro Mifune). It’s while under the influence of this Nikka whisky that Matsunaga accompanies his fellow gangland acquaintances to the nightclub. The group is serenaded by popular Japanese vocalist Shizuko Kasagi, who appears singing the original number “Jungle Boogie (Janguru bugi)”. 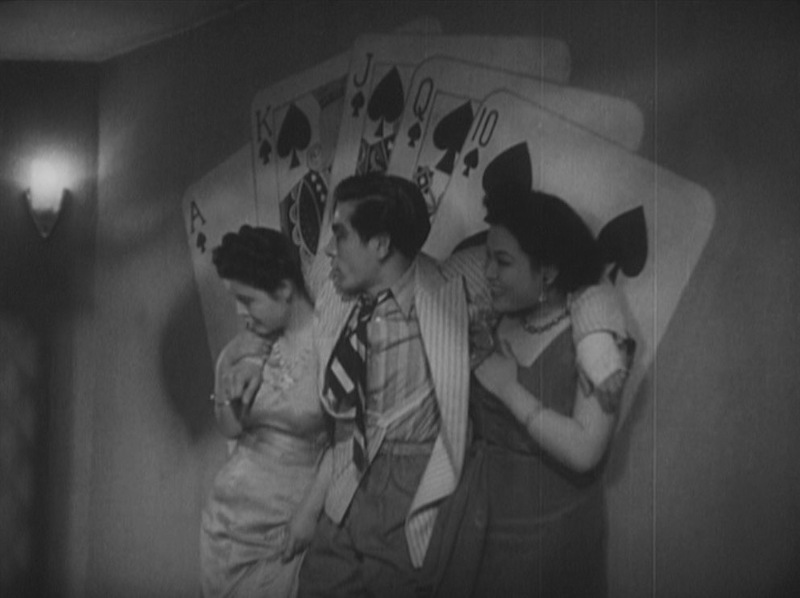 Matsunaga’s one-time girlfriend Nanae (Michiyo Kogure) has drifted into the arms of the gangster’s boss, but the drunken Matsunaga doesn’t care, grabbing a different woman in the club for a brief but vigorous dance that must exacerbate his increasingly delicate condition. 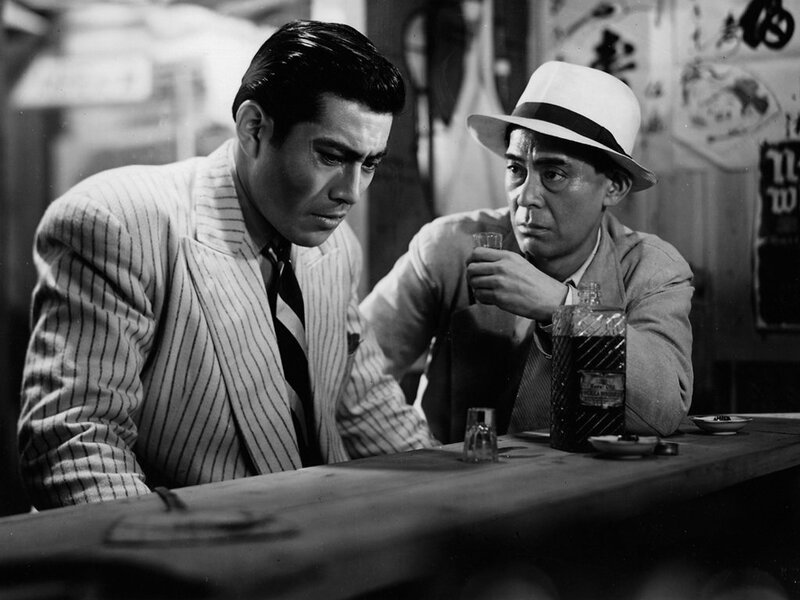 With music by Ryôichi Hattori and lyrics by Kurosawa himself, the director had penned and included this song to reflect the trends of American jazz and boogie woogie during the era. Indeed, he had also picked the right vocalist to perform it as Shizuko Kasagi enjoyed a reputation in post-war Japan as “Queen of the Boogie Woogie”, whether it was performing original numbers like “Kaimono Boogie” and “Tokyo Boogie Woogie” or American standards like “St. Louis Blues”. Matsunaga takes cues from wide, flashy post-war American fashions for his distinctive club-hopping attire.